< A trip to Knutsford! 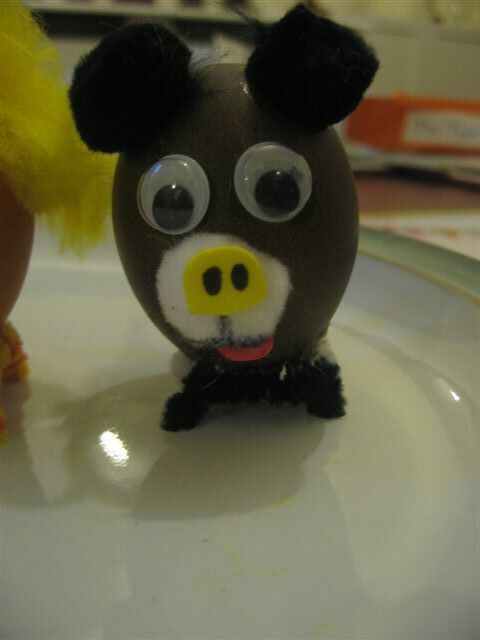 I’m probably not the only parent who received a letter recently telling them that their children had to decorate an egg for school. 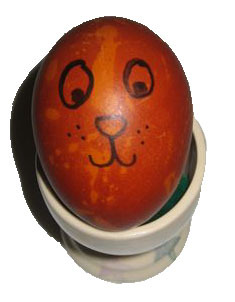 This seems to be a yearly tradition where the kids get messy, the parents worry about the eggs cracking and the teachers judge whose is best. Last year I found out about the competition too late and my kids didn’t enter. So this year we tried to be a bit more prepared and set to work decorating eggs last night. I started by looking online for some inspiration, there are some fantastic websites out there with all kind of eggy projects. A lot called for white eggs which I don’t think I’ve seen for years, but they were all very impressive and definitely competition worthy. 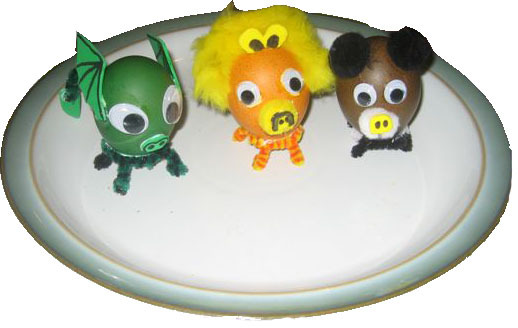 My kids liked the idea of making their eggs into animals, I could only find instructions for farm animal eggs online, so we had to make ours up as my son wanted to make a Lion, my daughter a Dog and my youngest a ‘Dagon’ (translation – Dragon). 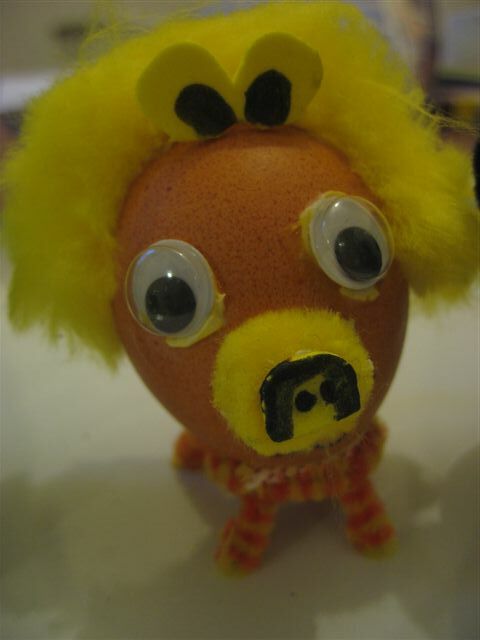 The lion is made by dying an egg yellow and then cutting up a pompom for his mane, cutting out ears and noses from foam and googly eyes. 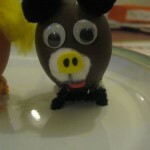 The dog is made by dying an egg brown and then using pompoms for ears and nose, then foam nostrils and tongue and more googly eyes. 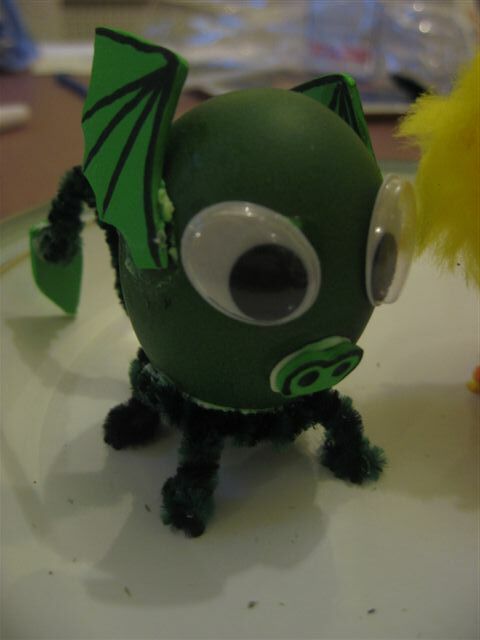 Then the Dragon was made by dying an egg green and attaching big googly eyes, a foam nose and wings. They all have pipecleaner legs and tails. 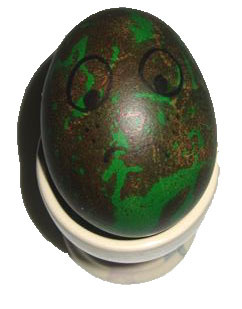 We also decided to make some marble eggs, to do this you dye an egg one colour first, then in a second pot of dye you add some oil (I used olive) and swirl the dye around the roll your eye in it and dry. 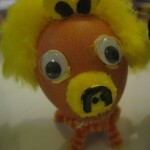 We made Cuthbert the happy egg. 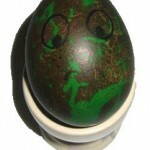 Then we made a Dinosaur egg. 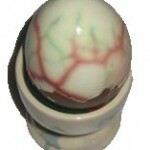 The nice thing about these marble eggs is I don’t think there’s any reason you can’t eat them. The dye is all made from edible ingredients. 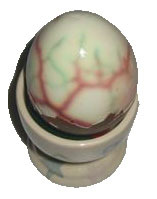 Here is an unpeeled marble egg (as eaten by my husband). 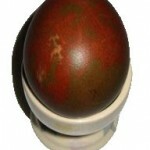 If you want to make some egg dye for yourself it’s really simple. Just take a small cup of hot water, add about 1 teaspoon white vinegar and then some food colouring. I used gel colouring to give a vibrant colour. 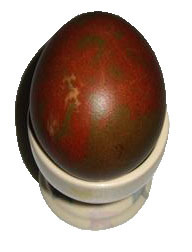 Just roll your eggs around in the dye until they are the colour you want and then dry. 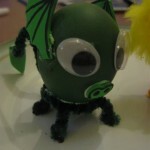 This entry was posted in Miscellaneous, Recipes, Tutorials and tagged dog, dragon, easter, egg dye, eggs, hardboiled, lion. Bookmark the permalink. 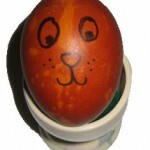 5 Responses to Eggcellant Easter Eggs! Such stunning eggs – and a really good tip about gel food colouring. The ones I did with my children years ago were very pale sad little offerings. Having seen the effect of rolling your eyes around in the dye I’ll probably pass on that one, as my eyes are red enough to start with! As for letting them dry…well..I use an expensive spray to try and keep them from itching. The Egg Eye is probably tasty enough to eat, and would raise and eyebrow or two if brought out in the office with my bread and butter!